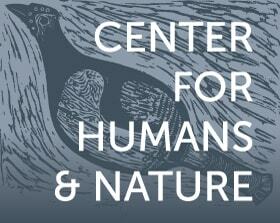 How can humans overcome fear and revitalize the world’s fragile honeybee populations? One muralist is on a mission to find out. Joe Phillips is the Urban Farm Coordinator at Near North Montessori in Chicago and writer at Dharma On The Farm. He interviewed New York-based artist Matt Willey by phone. 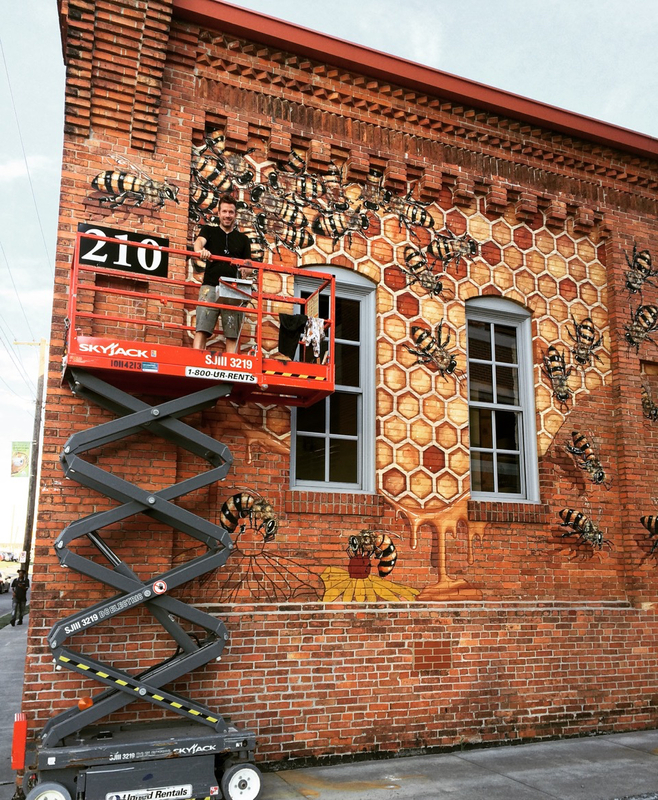 Matt’s goal through his inspiring project called The Good of The Hive is to paint 50,000 bees on murals around the world. Also in on the conversation was Dan Schnitzer, who invited Matt to create a mural at one of his sites. Dan is the Sustainability Coordinator at Chapel Hill-Carrboro City Schools. JP: Dan, you told a story on your Facebook page about the bees at one of your hives. You said on your post that “the problem is real and the signs are at our feet.” What did you mean by that? DS: Our beekeepers arrived at our high school one day and found approximately 1000 bees dead at the base of the hive. What was really staggering to me was the impact, the visceral reaction when I saw so many of them sitting at my feet. So that helped to open my eyes. With all the data and research that we have, at the end of the day we are all just human and we react to our experiences through our five senses. I’ve always known colony collapse was a problem because I’ve read or heard about it. But to have bees dead at your feet, and to have the academic knowledge to know that they are important in the world, then it really hits home: that this is a microcosm of what’s going on, and if I’m experiencing it here in our quaint little school yard, then the global problem is profound. JP: How were you able to ascertain that the massive bee death was most likely due to pesticides or herbicides? DS: Our beekeepers have a good relationship with the chief apiarist in the area. He came out to look at it and said that their pattern of death—the way that they are all outside the hive—appeared to be from exposure to chemicals as opposed to mites or vandalism. JP: Matt, this makes me think of your own introduction to your work with the bee murals. Can you tell us that story of how you got into this work? MW: Sure. I was in my studio in Manhattan, and a little bee flew into the window and landed on the rug. So I got down on the rug with it, and then I noticed that it was moving very slowly. Today I would have given it some honey and water and waited to see what happened. But at that time I literally sat there for a couple of hours with this bee until it died. I started researching honeybees, and came across an idea that really fascinated me called altruistic suicide. When a bee feels sick, it will exit the hive and fly off into the abyss for the good of the hive. That’s where the name [“The Good of the Hive”] eventually came from for the initiative. 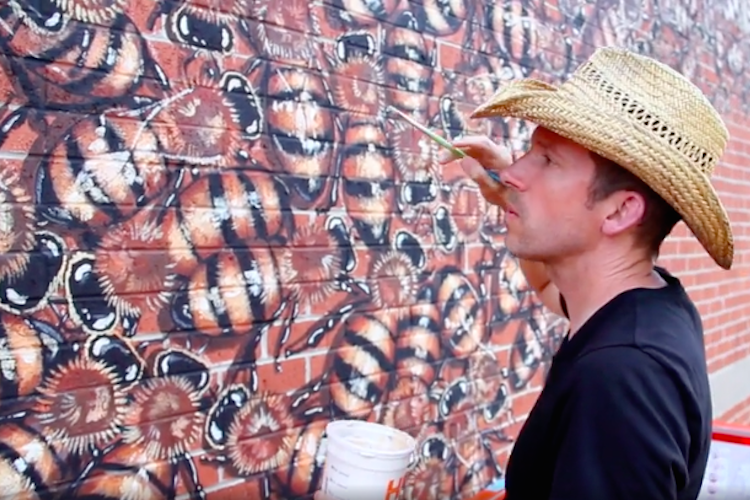 When I was painting my first honeybee-themed mural, I noticed that bees don’t just symbolize connection, they create it. 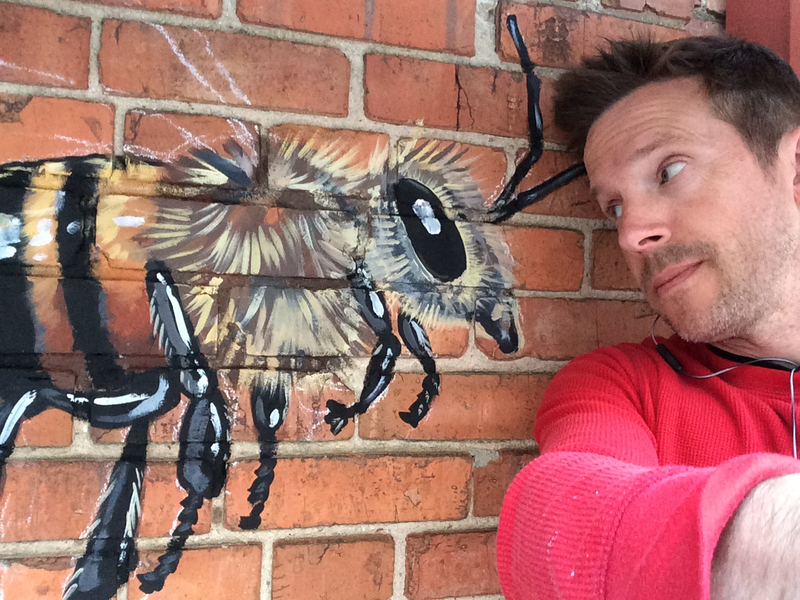 I don’t really know why or how, but when I started painting bees, everyone kept stopping and telling a bee story. Telling me something about this relationship that they have with bees. Everyone has a story. JP: Are most of those stories positive, or based on misunderstanding or fear? MW: I’ll tell you a story about this kid, Tobin. He was a culmination of what most people say when they stop to chat: they either have a sparkly enthusiastic story of their love of bees. Or, they tell me they are allergic but know that bees are important. And then there are the people who are afraid of getting stung. Anyway, this seven-year-old kid Tobin kept coming back to the mural. And he showed me the spot on his belly where he said he was stung by a bee. Then he got this huge grin like he was proud of this badge of honor. DS: There’s a wonderful book on parenting called The Blessing of the Skinned Knee. The concept being that if your kid comes home with an injury, clean it up and talk about what that experience was. They were doing something adventurous. They were trying something. They were running. They fell. They hurt. They healed themselves. How did they handle that pain? How do they get stronger from it? What did they learn from it? Flipping the perspective on fear. JP: Dan, all of this makes me think of David Sobel, and his concept of Ecophobia: either the direct fear of bees, or a more existential fear of their collapse. How does Ecophobia play out in your work? DS: Fear is simply a roadblock to connection. Think of all the things we do that cause us pain, and yet we see the value in it. Even if bees didn’t have value to humans, that doesn’t mean that we should kill them at will. The fact that we do value bees so much should amplify our need to help them, not hurt them. So in terms of Ecophobia, it’s relevant only because we make it relevant. For example, when we began installing hives at our schools, there was some pushback from staff about the few students who are allergic to bees (I believe there are two such students). My response to these concerns was: You let your teenager drive a car on a highway. You let your child go into the ocean. You let them go into the swimming pool. We have this disproportionate perspective on risk and fear. And really what’s the worst thing that a bee is going to do? If you're not one of those very few people who are allergic, it’s going to hurt a little bit. But we But we do [many activities that include some amount of risk] because it’s an essential part of our being. That’s the tax we pay for the life we want. Thanks to Tobin’s hurt belly, now he’s talking about bees. He has a memory of it, and that started a conversation that connected a really talented artist with a really thoughtful seven-year-old. JP: There's another part of that Ecophobia idea: that when we Western educators teach children about ecology, we tend to teach about the animals that are going extinct or are endangered. But children rarely get to interact with any wildlife, so their understanding of that wildlife is the fear of its collapse. MW: Yeah. I’m a fan of Carl Jung’s work, I’m really big on making peace with the shadow side. As a painter, there is no light without some darkness. You have to properly deal with the darkness. The shadow side of a situation is a bit of an illusion, because the reality is not what people think. A bee sting is not a dark thing—the fear around it is. I hope to draw everybody in and have some kind of renewed relationship to this creature. It’s taken me ten times as long to paint these murals because the mission is to talk to everybody. I give them a card and I talk to them. That’s one of the goals of this mission: not to just put up a pretty picture and move on. JP: It seems like we’re talking about changing one’s perception of the event. Then all of the sudden, you can actually work with it. MW: Exactly. A miracle is just a shift in perception. You have to give them an experience so that they can replace the one that was fearful. JP: How do you create that gateway for experience? MW: I paint the bees really big and get people excited about looking at them. Then they might look at one a little closer when they see one on a flower. I tell people that I’m on a mission, and the piece will be complete when I paint 50,000 bees. That’s the work of art. I’m in the middle of creation, of that process. 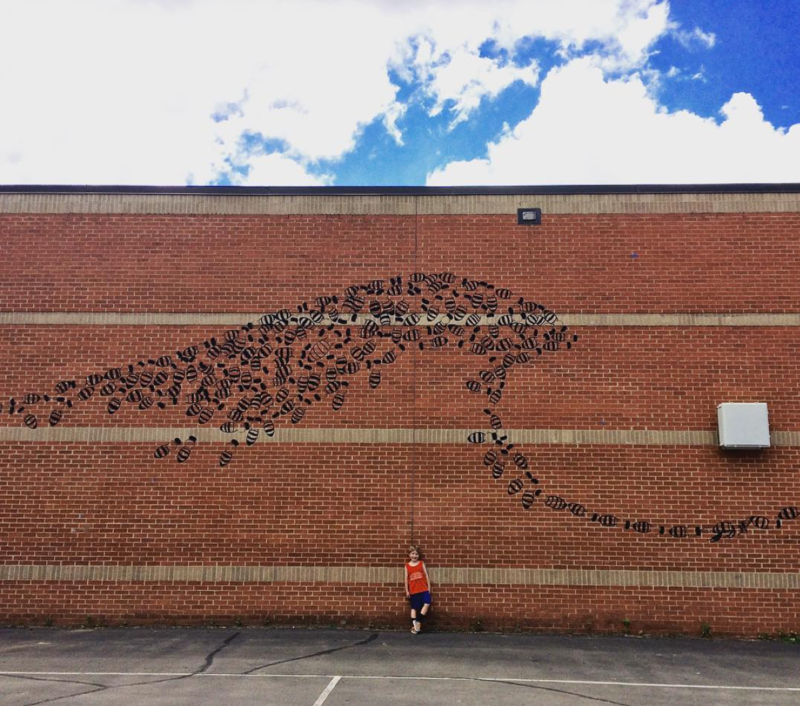 DS: Now that our mural [at Estes Hills Elementary School] is complete, it’s about not making it a static piece. It’s right there on the blacktop, where the kids have recess every day. It has a beautiful wave design, with some of the bees in a random order as is true in life. Now we have bees at a high school as a pilot program. We’re building a pollinator education program with the explicit goal of implementing it next year and then scaling it up to the entire school district and nationwide. It dovetails perfectly with the expansion of school gardens. So this creates the opportunity to have a native pollinator garden, which requires less maintenance, and it eliminates landscaping issues for our grounds staff, and then we have a habitat for the bees to thrive. Matt’s mural is definitely the jumping off point for all of it. JP: Matt, murals can be a way to commemorate something that is lost, or a call to action or revolution. Do you see your bee murals in either way? MW: The call to action part, if you can call it that, is to just notice them. We have to make a big change in this world. I reached out to a friend who is a huge political activist, and she asked if I’d ever heard of tikkun olam. Have you heard of it? JP: I haven’t. What’s that about? MW: This is an ancient Jewish concept that says: in the beginning of the world, there was a huge explosion that blew up into a zillion pieces. It’s not our job to put all the pieces back together. It’s each of our individual jobs to put one piece of the puzzle back together. It’s not about being comfortable. It’s about being called to do something. What’s your purpose? Just do that. Lately I find such solace in painting bees, even when it’s ninety-five degrees out. It feels so good to paint bees, to be in the solution rather than in the problem. It’s taking the action of connecting yourself that allows people to connect with you. Joe Phillips is the host of Farm On, a podcast of conversations with agriculturists, artists, and activists on the front lines of the food movement, and he writes essays on everything from agroecology to Zen at his website Dharma On the Farm.